Beryl Fraser, of Crocodile Nest B&B, submitted a great sequence of photos of a Spectacled Weaver pair that raised two broods in the same nest. 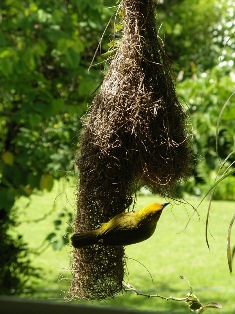 This is unusual as Spectacled Weavers will usually build a new nest when one brood has been raised. See all Beryl's PHOWN records here: click on each thumb-nail to see the full record details (right click and open each thumb-nail in a new tab or page, starting with record 1845; or see the thumb-nails at the bottom of each record page and click on the successive record numbers). Beryl did not know about PHOWN initially, but had photos that she could use to submit earlier records.